At FirstLight Home Care of Marin County, it’s our core belief that home care for us is more than a career – it’s a calling. Our goal is to provide compassionate support and assistance through home care and respite care in Napa, to any adult in need. We understand that when you come to us for help, it was not an easy decision, and it can be unsettling at first to let others into the comfort of your own home. Rest assured that all our caregivers have been thoroughly vetted, are trustworthy and experienced, and are dedicated to providing the best care for you and your loved one. Our Napa home care, respite care, and personal care services can come to the aid to any adult in need – Whether you have an aging loved one in need of extra care, are a new mom, have a disability, are chronically ill, or simply need some additional help around the house, we can be there. We can help with a variety of tasks around the house, including light housekeeping, meal preparation, and laundry. But our services don’t stop there; our travel companion services can provide aid with traveling and our companion care can provide warm company. We have years of experience in providing in-home care and strive to be leaders in the industry. Times are changing, life gets busy, and you can’t always be there to provide the additional care your loved one may need. Whether you or your loved one needs some help for a few hours a week, an entire day, overnight, or longer, we guarantee we’ll be available 24/7, seven days a week, 365 days a year. 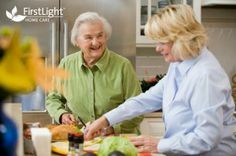 Enjoy peace of mind knowing your loved one is in good hands with FirstLight Home Care of Marin County. Contact us today for the best Napa home care, respite care, caregivers, and dementia care or Alzheimer’s care.